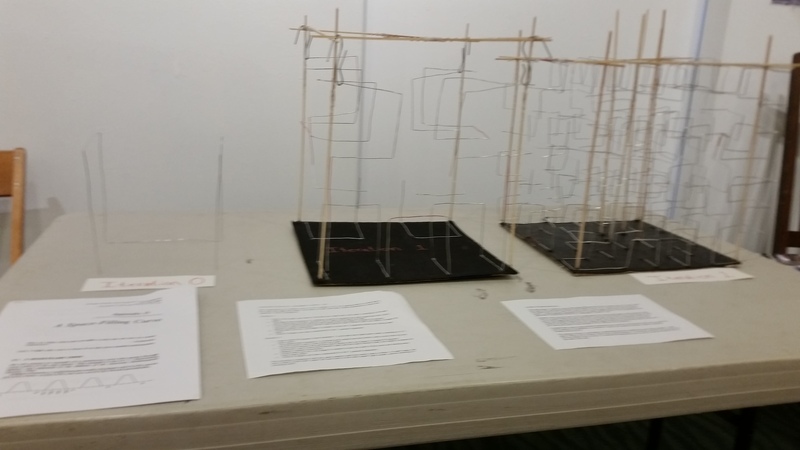 At the end of each year in Multivariable Calculus, I have students develop and execute their own “final project.” It’s fairly open-ended and students end up finding something they are personally interested/invested in and they go for it. This year I had six students and these are their projects. This student had never taken a statistics course but was interested in that. We also talked about how to find the area under the normal distribution using multivariable calculus (and showed it was 1). 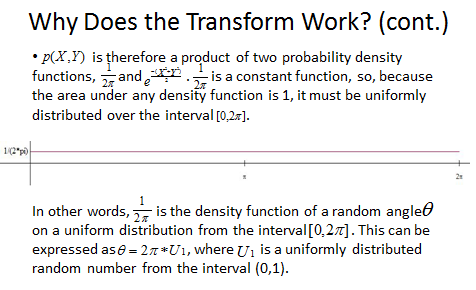 Armed with those two things, this student who likes computer science found a way to pick independently two numbers (one each from two uniform distributions), and have them undergo a few transformations involving square roots and sine/cosines, and then those two numbers would generate two new numbers. Doing this a bunch of times will create a whole pile of new numbers, and it turns out that those square roots and sine/cosines somehow create a bunch of numbers that exactly follow a normal distribution. So weird. So cool. This student loves Minecraft and hosts a Minecraft server where tons of kids at our school play. Earlier in the year, there was a big scandal because there were people cheating when playing on this server — using modifications to give themselves additional advantages. (This was even chronicled by the school newspaper.) One of the modifications allows players to see where the diamonds are hidden, so they can dig right to them. So this student who runs the server wanted to find a way to detect cheaters. 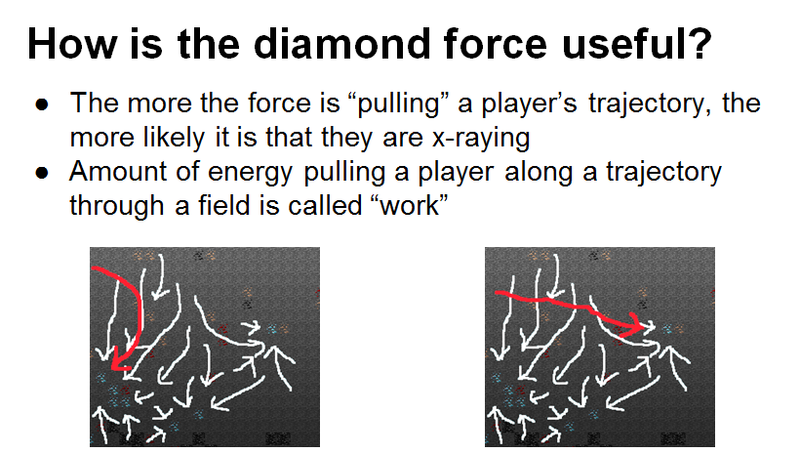 So he created a force field around each diamond (using the inverse square law in 3D), and then essentially calculated the work done by the force field on the motion of a player. A player moving directly with the force field (like on the left in the image above) will get a higher “work score” than someone on the right (which is moving sometimes with the forcefield, sometimes not). In other words, he’s calculating a line integral in a field. His data was impressive. He had some students cheat to see what would happen, and others not. And in this process, he even caught a cheater who had been cheating undetected. Honestly, this might be one of my favorite projects of all time because of how unique it was, and how perfectly it fit in with the course. This student with a more artistic bent was interested by “Space Filling Curves” (we saw some of them when I started talking about parametric curves in three dimensions, and we fiddled around with Lissajous curves to end up with some space filling curves). This student created three art pieces. The first was a 2D Hilbert curve which is space filling. The second was a 3D Hilbert curve which is space filling (pictured above). The third was writing a computer program to actually generate (live) a space filling curve which involves a parametrically defined curve, where each of the x(t) and y(t) equations involved an infinite sum (where each term in this infinite sum was reliant on this other weird piecewise and periodic function). I wish I had a video showing this program execute in real time, and how it graphed for us — live — a curve which was drawing itself and how that curve being drawn truly filled space. It blew my mind. This student, since a young age, loved watching the Game Show Network with his mother. So for his final project, he wanted to analyze game shows — specifically Deal or No Deal, and the big wheel in the Price is Right. I had never thought deeply about the mathematics of both, but he addressed the question: “When should you take the deal? 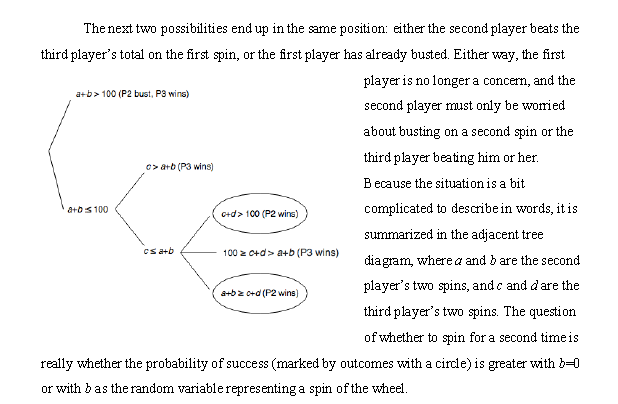 Is there an optimal time to do so?” (with Deal or No Deal) and “If you’re the second player spinning the big wheel (out of three players), how do you decide whether to spin a second time or not?” (for the Price is Right). As I saw him work through this project — especially the Price is Right problem — I saw so much rich mathematics unfold, involving generating functions, combining distributions, and simulating. It’s a deceptively simple question, with a beautifully rich analysis that hides behind it. And that can be extended in so many ways. 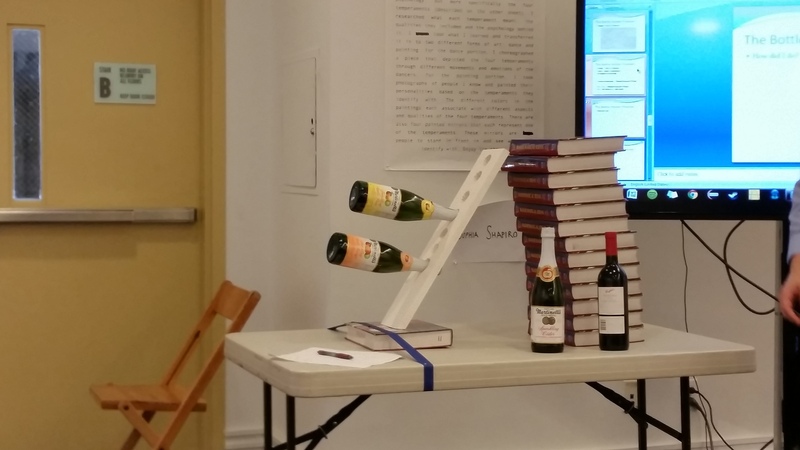 This photograph may make it look like the books are touching the wine holder. That is not the case. This wine holder is standing up — quite robustly as we tested — through it’s own volition. And — importantly — because the student who built it understood the principle behind the center of mass. This student’s project started out with him analyzing the “book stacking problem” (which involves how much “overhang” you can create while stacking books at the edge of the table. For example, with one book, you can put it halfway over the table and it will not fall. It turns out that you can actually get infinite overhang… you just need a lot of books. This analysis centered around the center of mass of these books, and actually had this student construct a giant tower of books. The second part of this project involved the creation of this wine holder, which was initially conceived of mathematically using center of mass, then that got complicated so the student started playing around with torque which got more complicated, so the student eventually used intuition and guess and check (based on his general understanding of center of mass). Finally he got it to work. The one thing this student wanted to do for his project was “build/create something” and he did!